If you're going to BrickCon this weekend, you'll be able to see this in person. Bruce Lowell, Alyse & Remi Gagne, and Brandon Griffith call themselves OneLug. They got together to create the Last March of the Ents. Another great find Bruce! The size of this is truly spectacular. Very well done. Also the water technique that they used is spot on. Excellent, I couldn't say anything bad about this moc, this......is......so.....cool! Are these people regular members here? Wow, incredible! I saw this MOC earlier and thought that it was extraordinary. I think it also points to what seems to be a growing trending in the Lego community. Large group projects are no longer the sole domain of the Lego town and train folks. I have seen great group projects among the science fiction and fantasy creators as well. I think the European Lego builders have been doing more collaboration for a while than their American counterparts but I think we're catching up on this end of the pond. Every now and then you see a creation that just makes you want to cry tears of joy. This is one of those for me. This is now assembled at BrickCon. I had time to watch a little as it was put together and then I spent some serious time last night taking in the details. This is an incredible build. It's packed with tons of cool action details. The Ents are awesome and Orthanc is stunning. Amazing. This really make me want to go to BrickCon. It's huge! This is so awesome.. Wow i cant even imagine how many bits went into making this. If I had to make a minor comment.. maybe the ents need a few more green bits... to make them a bit more treeish. otherwise its so amazing I wish I could see this in person. Simply amazing! Aside from the sheer size and near perfect duplication of Orthanc from the movies, I must say I'm very impressed with the water flow. I've seen people do small amounts of water like that (like streams and such) and thought it lackluster, but here as untamed floodwaters it it perfect. Everyone who took part in this build should be very proud of it. That is probably one of if not the most amazing MOC I have ever seen! The ents are perfect, especially the burning one. The tower is amazing, just like the film. The water as mentioned is spectacular. There isn't one thing about this MOC that I could say anything negative about. I bow before those who built this. This has to be the most insanely awesome build I've ever seen! I showed my LOTR-loving friends and we gasped at the size and complexity of this project. The water effects struck me as being the most ingenious, besides the tower of course. The Ents look absolutely amazing though, might have to build one myself sometime. This blew me away when I saw it online and when I saw it in person at brickcon I was even more stunned. This is something you can litterly look at for an hour and keep finding new things. Amazing work! 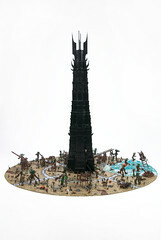 Velliscig wrote: The Ents look absolutely amazing though, might have to build one myself sometime. This was what impressed me most in person. Each one was a great MOC on it's own. Great work!! This truly is one of those builds that must be seen in person. The details are so many and intricate that they can't be fully appreciated in a picture. I was most pleased to be able to see it in the flesh. The tower is primarily SNOT, and it's sheen size is just jaw dropping. However I agree with Fras and BJim; the Ents really make it. They are hard enough to draw (remember the giant walking carrot from the 1978 version?) but to see them rendered like this was incredible! They each had personality, they even used black bricks to show the burnt part of the on-fire Ent. The builders were really copol too, each willing to answer the same question again and again.